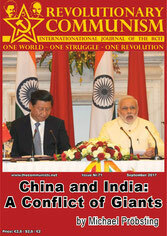 What are the background and the nature of the tensions between China and India in the Sikkim border region? What should be the tactical conclusions for Socialists and Activists of the Liberation Movements? Note of the Editorial Board: The following document contains 6 figures and 5 maps. India's OCOR as an Alternative to OBOR? How are the chances in a military confrontation between India and China? 1. What are the Respective Characteristics of an Imperialist vs. a Semi-Colonial State? 2. Is a Transition from Being One Type of State to Another Possible?